Removing a child from a home that is unstable and possibly dangerous is done in the best interest of the child by the state. But the immediate reality of being ripped from your parents and home can be terrifying and confusing. Often, the whole affair is done hurriedly with the intent of getting the child to safety as quickly as possible, leaving no time to gather essentials--a toothbrush, extra underthings--for the next few nights before reaching the intended foster family. To ease the fear and confusion of the transition period, Georgia resident Debbie Gori has dedicated her time to running Adventure Bags, a non-profit organization that fills book bags with necessities for children who are entering foster care or have been displaced from their homes. Adventure Bags was founded initially by Gori’s daughter, Tracey McMahon, a social worker for the Georgia Division of Family and Children’s Services (DFCS) in October of 2011. McMahon was delayed at the airport while she was escorting three small children in her care to their foster home. They had been removed from their home so suddenly that all they were able to bring with them were black trash bags with a few items thrown in. This was unacceptable to McMahon: she bought book bags at the airport, stuffing them with a change of clothes and essentials such as soap, toothpaste and toothbrushes. McMahon has since stepped down from the role of Adventure Bags president to focus on her job as a social worker, though she does volunteer frequently. Her mother Debbie, retired and living in Barrow County, has taken the reins, along with Tracey’s husband, Eric. 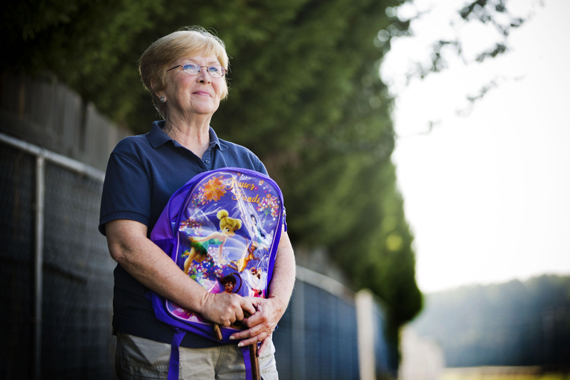 “I had a child in foster care tell me what the bag was to her,” says Gori, “It was hers, and she carried it everywhere. She said, ‘It’s mine. Nobody can take this from me.’ She carried all of her things in there,” recalls Gori, before explaining how the children are often in awe about having something to really call their own. Adventure Bags is currently waiting to hear back on its status for 501C3 certification, to become an official non-governmental organization. The non-profit operates out of Gori’s home, with rooms reserved for fundraising paraphernalia, book bags, and a stockpiled inventory of items for various age groups of infants, kids, tweens and teens. Gori worries that operating from her home reflects badly on the organization, and has even looked into purchasing a house to set up offices for Adventure Bags, but funds are low. Nevertheless, the organization has come a long way in a single year. Various other organizations such as Safe House—a shelter for victims of domestic abuse—and Children After the Fire—which aids children who have recently lost everything in a blaze—have approached Gori and received Adventure Bags of their own. In fact, as October is National Domestic Violence Awareness month, all the bags were sent to the various branches of Safe House around Georgia. Gori has also developed a close relationship with the Georgia Division of Family and Child Services, who keep Adventure Bags at their various offices and alert her when they need more. But sometimes, it’s not the first thing on a social worker’s mind when trying to remove a child from a dangerous situation. “On my side: How hard is it to remember a bag?” chides Gori. “Well you have to step outside and look at what they’re doing. Gori also has the presidents of the Barrow County Foster/Adoptive Parent Association on her team, Chris and Misty Manus. It was a pleasant surprise for the retired mother of two when the Manus’ relayed a conversation from their night at a Foster Parents Association event, in which Adventure Bags came up. “This lady just got all excited and said, ‘we have two of the three children and I’m going to tell you they will not let go of those bags!” she says, referring to the very children who prompted McMahon to start Adventure Bags. Along with items like toothpaste and shampoo, much thought and effort is stuffed into a single Adventure Bag. Various counties in Georgia have orchestrated “stuffings” for Adventure Bags, in church basements, at schools and Girl Scout troop meetings. Gori made it a point to ask children themselves what they thought would work well in an Adventure Bag. “We’ve had children in there [at stuffing events] who I did not know at the time were actually foster kids, and they gave me the idea to put journals in the bags. A little boy wanted journals ‘so we can write our personal thoughts down.’ Those was his words specifically,” Gori says. “They came up with all sorts of fun things a kid would, you know ‘an MP3 player would be great’ and I’m like sure I’d like one too, but you know,” she trails off, laughing. A well-wisher from Amarillo, Texas, sends Adventure Bags “encouragement cards” to place into the bags, and children have taken to writing them as well—a gesture for children, by children. The bags in demand the most are those for tweens and teens, the age groups that are most frequently ferried around the system. Gori estimates that her organization manages to churn out 50 bags a month, though more are always needed. Despite Gori’s successes with Adventure Bags, she remains frustrated. So far, they’re still waiting on the certification to become a 501C3, the lack of which hinders any possibilities of receiving a grant. Though Adventure Bags has expanded from six to 16 counties, Gori laments the lack of involvement.